BIG R is committed to serving the ranch and farm community! With 4 acres of yard inventory, we'll have what you need. BIG R's ATV, Lawn Tractor, and 3 PT implements will cover any job big or small. 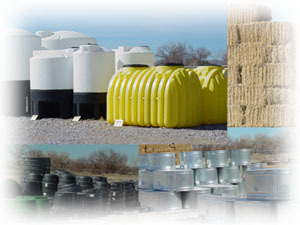 BIG R also carries liquid holding tanks suitable for potable water, liquid fertilizers, and chemicals. Our inventory includes horizontal tanks, vertical tanks, conical tanks, and pick-up tanks with holding capacities from 125 to 3000 gallons! BIG R also has dual stage septic tanks! If we don't have what you need, we'll get it!